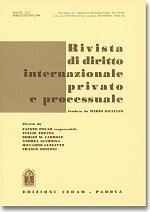 The third issue of 2012 of the Rivista di diritto internazionale privato e processuale (RDIPP, published by CEDAM) was just released. It features three articles and four comments. In the first article, Claudio Consolo, Professor of Law at the University of Padua, discusses the new proceedings for interim relief (with full cognizance) for the ascertainment of the effectiveness of foreign judgments in Italy after Legislative Decree No. 150/2011 (“Il nuovo rito sommario (a cognizione piena) per il giudizio di accertamento dell’efficacia delle sentenze straniere in Italia dopo il d.lgs. n. 150/2011”; in Italian). In the second article, Costanza Honorati, Professor of Law at the University of Milano-Bicocca, offers a critical appraisal of provisional measures under the proposal for a recast of the Brussels I Regulation (“Provisional Measures and the Recast of Brussels I Regulation: A Missed Opportunity for a Better Ruling”; in English). In the third article, Theodor Schilling, Professor of Law at the Humboldt University of Berlin, discusses the enforcement of foreign judgments in the case-law of the European Court of Human Rights (“The Enforcement of Foreign Judgments in the Jurisprudence of the European Court of Human Rights”; in English). Cristina M. Mariottini (Senior Researcher at the Max Planck Institute Luxembourg for International, European and Regulatory Procedural Law), “Statutory Ceilings on Damages under the Rome II Regulation: Shifting Boundaries in the Traditional Dichotomy between Substance and Procedure?” (in English).